Barack Obama’s job approval rating has tumbled since shortly after his re-election, as the public’s economic expectations for the coming year have soured. Despite substantial public awareness of recent gains in the stock market and rebounding real-estate values, the percentage saying economic conditions will get worse over the next year has risen to its highest point in nearly eight years. 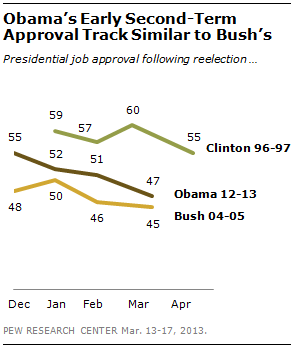 Obama’s job approval measure has fallen eight points since December, from 55% to 47%. His rating is comparable to George W. Bush’s (45%) at the same point early in his second term and is much lower than Bill Clinton’s 60% rating in February 1997. The latest national survey by the Pew Research Center, conducted March 13-17 among 1,501 adults, finds that despite Obama’s lower job rating, he retains greater public confidence than congressional Republicans in dealing with the budget deficit: 53% express at least a fair amount of confidence in him to handle the budget, compared with 39% who express the same confidence in GOP leaders. The decline in Obama’s approval rating comes at a time when the number of Americans saying that real estate prices have gone up has jumped from 25% in 2011 to 52% currently, and 71% of investors say the value of their portfolios have increased. Yet the survey also finds that large percentages of Americans – particularly those with lower family incomes – continue to face severe economic and job-related problems. 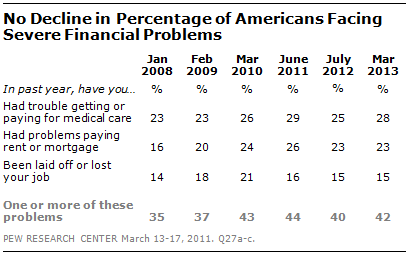 Nearly three-in-ten (28%) say they have had trouble getting or paying for medical care in the last year, while nearly as many (23%) report problems with paying their rent or mortgage. And 15% say they have been laid off or lost their job in the past year. The share experiencing one or more of these problems is as high today as it was during the recession: Currently, 42% say they have encountered at least one of these problems, including 60% among those with annual family incomes of $30,000 or less. 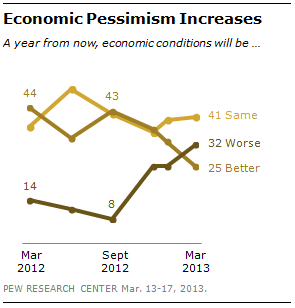 When it comes to views of the national economy, most Americans do not think a recovery has taken hold. Just 27% say that the economy is recovering, while 31% say it will recover soon and 40% say it will be a long time before the economy recovers. These views have changed little over the past year. Looking ahead, the public’s forecast for the national economy has deteriorated. A year ago, nearly three times as many Americans expected the economy to be better as worse in the next year (44% vs. 14%). Today, just a quarter (25%) expect economic conditions to be better a year from now, while nearly a third (32%) say conditions will be worse. The market turnarounds are having a limited effect on the public’s economic outlook because they are not what affect people’s personal financial situation. When people are asked to consider the personal impact of different economic factors, just 32% say their household finances are affected a lot by real estate values, while even fewer (23%) say that the stock market has a major effect. 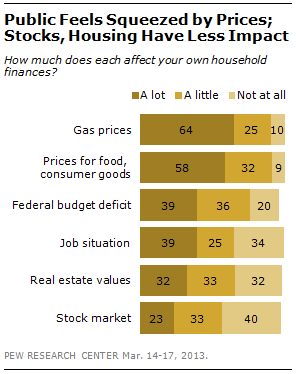 Instead, far more Americans say their households are affected by prices – both gas prices (64% a lot) and prices for food and consumer goods (58%). Prices are not only viewed as more important than real estate or the stock market but also the federal budget deficit and even the availability of jobs (39% each). And the news about prices is decidedly bad. The March update of the Pew Research Center’s track of what people are hearing about the economy found 74% saying the news about gas prices was mostly bad, and 52% saying the same about consumer prices. 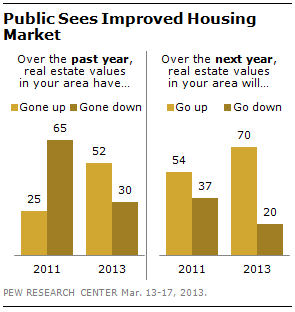 Rising prices also now rank near the top of the public’s economic worries. Currently, 32% say the job situation is the national economic issue that worries them most, while 29% cite rising prices and 27% the federal budget deficit. Just three months ago, jobs far surpassed all other economic worries – 40% cited the job situation, 25% said the budget deficit and just 22% rising prices.